Ok, so I got into the car this morning and went to back out the driveway and water came pouring in from the Onstar microphone and over the lip of the headliner where the sunroof goes. I took it to the dealership and they stated that the drains were clogged for the sunroof. They said that they fixed them. they also fixed the hood louver recall that I am sure you all have received. A little more than half way home (100 miles one way), there was a gurgling sound coming from the area of the sunroof. Has anyone had this problem??? It is a common problem if you don't keep the drains around the sunroof cleaned out. I have a 2006 H3 and the water leaks through my dome light. I also was told that the sunroof drains get clogged. I've gotten them cleared a couple of times and then it's fine for several months. Need to have it done again. Is this something I can do myself? Sun roof fixed for 79 cents, not the drains. Ok, I was another victim of the sun roof leaking. WAS being the operative word. Mine would fill up so bad water would run out of my dome light, out of my onstar microphone, when I hit the brakes water would splash from under the headliner onto my dash, my floor liners would fill up with water, thank goodness I had those instead of the standard floor mats. About a week ago a friend of mine told me that the drains will only handle a small amount of water, if large amounts of water are coming through, it has nothing to do with stopped up drains. Makes sense since the drain holes are tiny. He said if you replaced the the seal on the sunroof it would probably fix the issue. And that's probably what a dealer would do. However, try this first. Glob Vaseline around the seal on a hot day. Sceptical, but desperate, I tried it. Put nearly half a small jar of the gooey stuff all over the seal. In about an hour it was all gone, melted down and soaked up into the seal. That was over a week ago. Yesterday we had some sever thunderstorms and heavy rainfall. I was expecting to bail out my floorboards again. Much to my surprise, not one single drip or drop or damp spot. No real effort and used less than a dollars worth of Vaseline. The reason it worked is Vaseline is petroleum based. It actually permeated the rubber and caused it to swell. NOT good for the longevity of the rubber seal! Eventually this will come back to haunt you when your seal begins to deteriorate. You would be better off using a silicone based lube made specifically for weather stripping and door seals. Keeps them lubricated and supple, creating a better seal. Good suggestion. Wonder if the silicone would work as well since it would not permeate the seal. Too late for me now. Looks like even with the Vaseline, your extending the life of the seal, assuming it is bad anyways. Of course if I had to do it over, i would try the silicone first. Never gave it a thought. Just has my sunroof drian hoses replaced to the new 'upgraded' one's 2 days ago. I still have the OEM one's. The new one's are a bit firmer and they said will kink less. My drains were blocked 100% so when it rained, I had water thru the mic and drips on the window posts. I had to park the truck in my driverway (uphill) so it wouldn't leak. When I picked up my truck, it was raining VERY hard for a few hours and my truck was left on a slight down hill slope. (Which would make the leak much worse) I got in the truck, NO LEAK!!! Gone with the new hoses. About a month ago I also siliconed all the roof lights on a hot day. Pulled them all out and cleaned around them first. The two outter most lights have huge holes that water could get into. I know that stopped some water from getting in. Pour a little wheel cleaner into each side of the sunroof drain pan. It eats through the crud and doesn't harm your rubber lines. I have been doing it as a maintenance for several years and no more leaks! Hey everyone - just read some great ideas on this forum to clear the infamous plugged drain lines on the H3 sunroof. I tried something a little different - I used an injection syringe the type you use to measure the fuel oil mixture for a grass trimmer etc., attached an air mattress blow tip, the type used to inflate beach toys etc. ( thanks to my daughter who found one for me). I injected water directly into the drain tube on the passenger side drain tube so to provide a bit of pressure then noticed the water backed up - obviously blocked with debris. 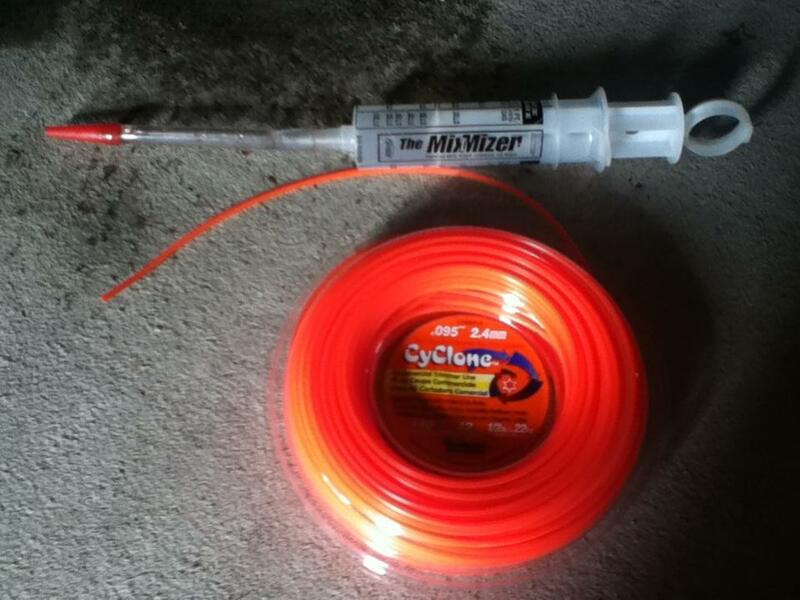 Then I used a .095 cyclone weed trimmer line (any line of that diameter will do) and fed it into the drain tube working it in and out so to get it around what felt like a kink or blockage...with a bit of patience the line cleared and the remaining water chased the debris through the line and drained onto the garage floor. I continued to feed the line through the drain hole until I heard it clear the end of the drain line and into the engine compartment to confirm a clear passage - a lot of small particulate came out which obviously blocked the lines. Thanks to SPUDS and his idea - I poured a little wheel cleaner through as well to clear out any remaining particles and hopefully dislodge anything else which may hamper water flow/drainage in the future - big test is when it rains. Hope this bit of info may help others in the same situation. GREAT FORUM Guys!!!!! !